One of the most distinct aspects of Christmas in Cork is the presence of SHARE collectors throughout the city centre in the week leading up to Christmas Day (which, obviously from my point of view, creates unique geographies). SHARE (Students Harness Aid for the Relief of the Elderly) is a Cork-based charity which supports older people through housing, socialising and activities. It is a most excellent organisation that does a massive amount of work throughout the year. Also, it involves a special connection between older people and students in the city. The annual Christmas collection is one of the charity’s main fundraising initiatives. It is run by young volunteers, mainly 16 and 17 year olds from secondary schools across Cork city, with a core group organising the project since September and hundreds of volunteers who give up their time to collect during the hectic days of Christmas shopping. 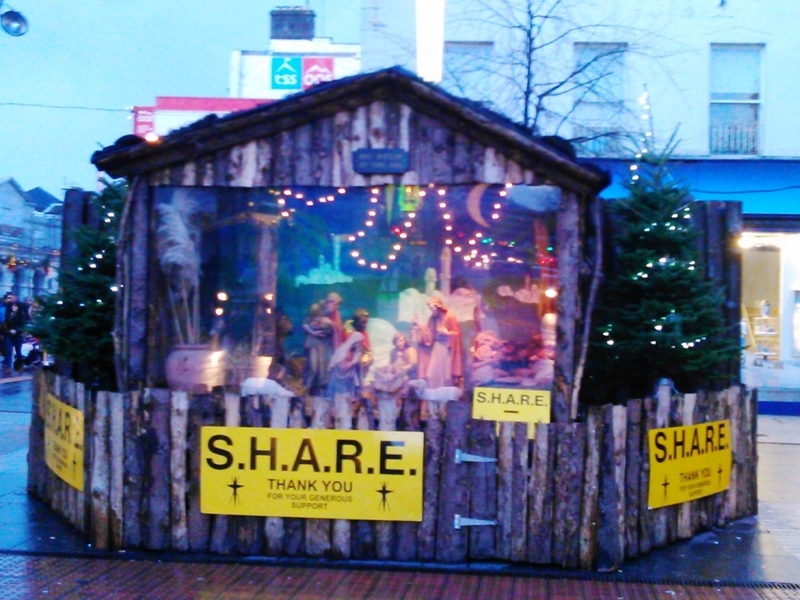 The SHARE Crib acts as a focal point for the week’s activities. The presence of collectors across the city centre, with their distinctive yellow jackets and vests, gives the city a unique feel in the lead up to Christmas. Although, other worthy organisations and causes may be collected for, during this week Cork is SHARE territory. Collectors can be found on every street corner, while some go on fasts and collect throughout the night. The sheer volume of volunteers, along with their enthusiasm, means it is in your own interest to support them and get a yellow sticker, which provides you with an ‘immunity’ from other collectors. In an age of chuggers, the earnestness of the collectors and transparency of the organistion ensure the support of the shoppers. 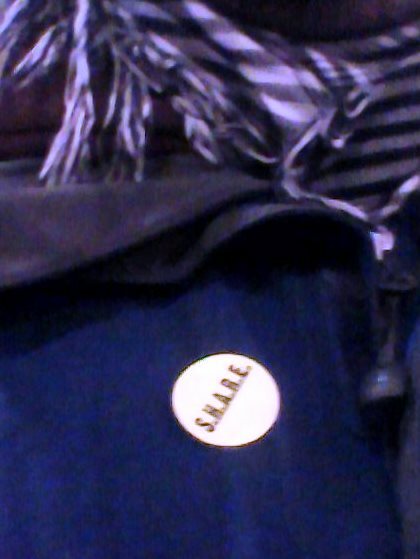 The SHARE sticker, found on every coat for Cork people, leading up to Christmas. The devotion and passion of the students, the local cause and the festive tradition combine to give SHARE a special status in the life of the city. The patterns of giving, the spread of volunteers, the shaking of the collection boxes, the meaning of the stickers, the Crib and the sentiments behind students helping the elderly, produce some of the geographies I feel compelled to mention!